"Shiga" redirects here. For other uses, see Shiga (disambiguation). Shiga Prefecture (滋賀県, Shiga-ken) is a prefecture of Japan, which forms part of the Kansai region in the western part of Honshu island. It encircles Lake Biwa, the largest freshwater lake in Japan. The capital is Ōtsu. Shiga was known as Ōmi Province or Gōshū before the prefectural system was established. Omi was a neighbor of Nara and Kyoto, at the junction of western and eastern Japan. During the period 667 to 672, Emperor Tenji founded a palace in Otsu. In 742, Emperor Shōmu founded a palace in Shigaraki. In the early Heian period, Saichō was born in the north of Otsu and founded Enryaku-ji, the center of Tendai and one a UNESCO World Heritage Site and monument of Ancient Kyoto now. In the Medieval Period, the Sasaki clan ruled Omi, and afterward the Rokkaku clan, Kyōgoku clan and Azai clans ruled Omi. In the 1570s, Oda Nobunaga subjugated Omi and built Azuchi Castle on the eastern shores of Lake Biwa in 1579. Tōdō Takatora, Gamō Ujisato, Oichi, Yodo-dono, Ohatsu and Oeyo were Omi notables in the Sengoku period. In those times, Ninja were active in Kōka (See also Kōga-ryū). In 1600, Ishida Mitsunari, born in the east of Nagahama and based in Sawayama Castle, made war against Tokugawa Ieyasu in Sekigahara, Gifu. After the battle, Ieyasu made Ii Naomasa a new lord of Sawayama. Naomasa established the Hikone Domain, later famous for Ii Naosuke. Ii Naosuke became the Tokugawa shogunate's Tairō and concluded commercial treaties with the Western powers and thus ended Japan's isolation from the world in the 19th century. Besides the Hikone Domain, many domains ruled Omi such as Zeze. With the abolition of the han system, eight prefectures were formed in Omi. They were unified into Shiga Prefecture in September 1872. "Shiga Prefecture" was named after "Shiga District" because Otsu belonged to the district until 1898. 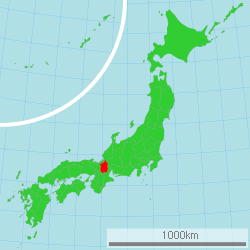 From August 1876 to February 1881, southern Fukui Prefecture had been incorporated into Shiga Prefecture. In 2015, Shiga Governor Taizō Mikazuki conducted a survey asking citizens whether they felt it necessary to change the name of the prefecture, partly to raise its profile as a destination for domestic tourism. Lake Biwa, Japan's largest, is located at the center of this prefecture. It occupies one-sixth of its area. The Seta River flows from Lake Biwa to Osaka Bay through Kyoto. This is the only natural river that flows out from the lake. Most other natural rivers flow into the lake. There were many lagoons around Lake Biwa, but most of them were reclaimed in 1940s. One of the preserved lagoons is the wetland (水郷, suigō) in Omihachiman, and it was selected as the first Important Cultural Landscapes in 2006. 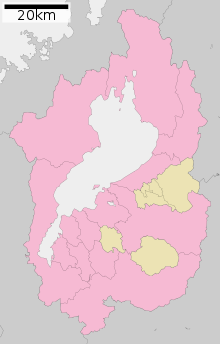 The lake divides the prefecture into four different areas: Kohoku (湖北, north of lake) centered Nagahama, Kosei (湖西, west of lake) centered Imazu, Kotō (湖東, east of lake) centered Hikone and Konan (湖南, south of lake) centered Otsu. Plains stretch to the eastern shore of Lake Biwa. The prefecture is enclosed by mountain ranges with the Hira Mountains and Mount Hiei in the west, the Ibuki Mountains in the northeast, and the Suzuka Mountains in the southeast. Mount Ibuki is the highest mountain in Shiga. In Yogo, a small lake is famous for the legend of the heavenly robe of an angel (天女の羽衣, tennyo no hagoromo), which is similar to a western Swan maiden. Shiga's climate sharply varies between north and south. Southern Shiga is usually warm, but northern Shiga is typically cold with high snowfall and hosts many skiing grounds. In Nakanokawachi, the northernmost village of Shiga, snow reached a depth of 5.6 metres (18 ft) in 1936. As of 1 April 2014, 37% of the total land area of the prefecture was designated as Natural Parks (the highest total of any prefecture), namely the Biwako and Suzuka Quasi-National Parks; and Kotō, Kutsuki-Katsuragawa, and Mikami-Tanakami-Shigaraki Prefectural Natural Parks. The current governor of Shiga is Taizō Mikazuki, a former member of the House of Representatives from Shiga (DPJ, 3rd district), who was elected in July 2014 to succeed governor Yukiko Kada. 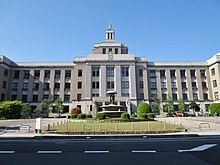 The prefectural assembly has 47 members from 16 electoral districts, and is still elected in unified local elections (last round: 2011). As of July 2014, the assembly was composed as follows: LDP 21 members, DPJ/kenmin network 12, Taiwa no kai/Shiga net 5, LDP sasshin no kai 5, Kōmeitō 2, Your Party 1, independent 1.
in the class of 2013 (term ends 2019): Takeshi Ninoyu, LDP, 1st term. Cultivated areas occupy nearly one-sixth of the prefecture. Rice is the principal crop: over 90 percent of the farmlands are rice fields. Most farms are small, producing only a slight income. Most farmers depend on income from other sources. Eastern Shiga is famous for cattle breeding and southeastern Shiga is famous for green tea. On Lake Biwa, some people are engaged in fishery and freshwater pearl farming. Since the Medieval Period, especially in Edo period, many Shiga people were active in commerce and were called Ōmi merchants (近江商人, Ōmi shōnin, Ōmi akindo), sometimes Ōmi thieves (近江泥棒, Ōmi dorobō) by other envious merchants. For example, Nippon Life, Itochu, Marubeni, Takashimaya, Wacoal and Yanmar were founded by people from Shiga. In their home towns such as Omihachiman, Hino, Gokashō and Toyosato, their mansions were preserved as tourist attractions. Beginning in the 1960s, Shiga developed industry, supporting major factories owned by companies such as IBM Japan, Canon, Yanmar Diesel, Mitsubishi, and Toray. According to Cabinet Office's statistics in 2014, the Manufacturing sector accounted for 35.4% of Gross Shiga Product, the highest proportion in Japan. Traditional industries include textiles, Shigaraki ware, Butsudan in Hikone and Nagahama, medicines in Koka, and fan ribs in Adogawa. The population is concentrated along the southern shore of Lake Biwa in Otsu city (adjacent to Kyoto) and along the lake's eastern shore in cities such as Kusatsu and Moriyama, which are within commuting distance to Kyoto. The lake's western and northern shores are more rural and resort-oriented with white sand beaches. In recent years, many Brazilians settled in Shiga to work in nearby factories. 25,040 foreigners live in Shiga and 30% of foreigners were Brazilians as of December 2016. Biwa Town (now a part of Nagahama) is a home of The Tonda Traditional Bunraku Puppet Troupe. Founded in the 1830s, the group is one of the most active traditional Bunraku puppet theaters in Japan outside the National Theater in Osaka. Toyosato and Higashiomi are known to a mecca of Goshu ondo. Museums include the Sagawa Art Museum in Moriyama, the Lake Biwa Museum in Kusatsu and the Miho Museum in Kōka. In Kōka, a ninja house is preserved as a visitor center. Since ancient times, Shigans have eaten fish from Lake Biwa. The most famous lake-food is fermented sushi of crucian carp (鮒寿司, funa-zushi). It retains the ancient style of sushi and has a pungent odor. Shiga is also famous for high quality wagyū, Ōmi beef. The Hikone Domain presented beef as medicinal food to shōguns. In addition, tsukemono of root crops, mallard nabe or mallard sukiyaki (鴨鍋 or 鴨すき, kamo-nabe or kamo-suki) in northern Shiga, red colored konjac (赤こんにゃく, aka konnyaku) in Omihachiman, sōmen with grilled mackerel (焼鯖素麺, yaki-saba sōmen) in Nagahama, and lightly seasoned champon in Hikone are examples of specific cuisine in Shiga. Biwako Broadcasting broadcasts local TV programs. NHK has a broadcasting station in Otsu. Shiga is the only prefecture which has no regional newspapers. Kyoto Shimbun is a de facto regional newspaper of Shiga. Ten universities, two junior colleges, and a learning center of The Open University of Japan operate in Shiga. The following sports teams are based in Shiga. Football (soccer): MIO Biwako Kusatsu (Kusatsu), Sagawa Shiga F.C. (Moriyama). The main gateways to Shiga are the Maibara Station in northern Shiga and the city of Ōtsu in the south. The Maibara Station is about 2 hours and 20 minutes away from the Tokyo Station by the Tokaido Shinkansen. It is easy to go to Ōtsu from Kyoto and Osaka by high-speed trains. Shiga's most prominent feature is Lake Biwa. The northern shore is especially scenic, such as the cherry blossoms of Kaizu Osaki in spring and the sacred island Chikubu-shima. The western shore has white sand beaches, popular among Kyotoites during the summer. The scenery of the southern shore, particularly around Otsu, was selected as Ōmi Hakkei or Eight Views of Ōmi, popularized by Hiroshige's ukiyo-e. Most of the original eight views are now almost gone or changed from centuries ago. One remaining view is the Ukimidō "floating temple" building at Mangetsu-ji temple in Katata, northern Ōtsu. It was reconstructed with concrete in 1937, but a small temple still stands on the lake near the shore, accessible by a short bridge. Another scene features Ishiyama-dera temple in southern Otsu, which is also renowned for having a room where Murasaki Shikibu thought up the plan for some chapters of Tale of Genji. The mountains around the lake offer extensive views. Mount Hira is a picnic spot. Mountain roads like the Oku-Biwako Parkway road up north and the Hiei-zan Driveway and Oku-Hiei Driveway overlooking the southwestern shore. In Ōtsu, the Ōtsu Prince Hotel's Top of Otsu restaurant provides views of the lake and city. The Michigan paddlewheel boat offers lake cruises. Besides the natural environment, historical buildings and festivals persons rank among those of national importance. Shiga has 807 National Treasures and Important Cultural Properties, that ranks the fourth large number in Japan. Shiga's most famous historical building is Hikone Castle, one of four national treasure castles in the country. The castle tower is well preserved and has many cherry trees. The neighboring city of Nagahama has tourism in addition to its hikiyama festival. Nearby shrines include Hiyoshi Taisha in Otsu and Taga-taisha in Taga, which respectively head the seventh and twentieth largest shrine networks in Japan, at about 4,000 shrines and 260 shrines, respectively. Festivals include the hikiyama festival (floats parade festival), held in ten areas such as Nagahama, Otsu, Maibara, Hino and Minakuchi. The Nagahama hikiyama festival held each April is one of the three major hikiyama festivals in Japan and was designated an Important Intangible Cultural Property in 1979. During this festival ornate floats are mounted with miniature stages on which boys (playing both male and female roles) act in kabuki plays. Higashiomi (formerly Yōkaichi) city holds a Giant Kite Festival every May along the riverbank. Ordinary people are invited to pull the rope that sends the kites aloft. Meishin Expressway, Shin-Meishin Expressway and Hokuriku Expressway pass through Shiga. National highway Route 1, 8, 21, 8, 161, 303, 306, 307, 365, 367, 421, 422 and 477 connect with neighboring prefectures. 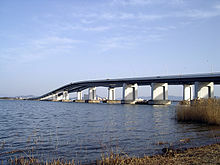 Two bridges span southern part of Lake Biwa. With development of land transportation in the 20th century, waterborne transportation in Lake Biwa was disused except for steamer services to islands on the lake and pleasure boats. Sōsuke Uno, the 75th prime minister from Moriyama. He was one of the shortest-serving prime ministers in Japan, holding office for only three months (June–August 1989). Takanori Nishikawa, a singer and actor from Hikone and Yasu. He is also active as the first Cultural Ambassador for Shiga. Hizaki, a musician and songwriter, known for work as guitarist of Versailles. Kizo Yasui, former vice-president of Mitsui Bank, former president of Mitsui Petroleum and Chemical Industries (now Mitsui Chemicals), former chairman of Toray Industries, former vice-chairman of Nihon Keidanren (Japan Business Federation), former general manager of Tokyo Metropolis of Ise Shrine Revered Board. Shiga has cooperative agreements with three states. ^ Nussbaum, Louis-Frédéric. (2005). "Shiga-ken" in Japan Encyclopedia, p. 853, p. 853, at Google Books; "Kansai" at Japan Encyclopedia, p. 477, p. 477, at Google Books. ^ Nussbaum, "Ōtsu" at Japan Encyclopedia, p. 765, p. 765, at Google Books. ^ Nussbaum, "Provinces and prefectures" at Japan Encyclopedia, p. 780, p. 780, at Google Books. ^ "Shiga Prefecture mulls name change to draw more visitors". The Japan Times. ^ Shiga Prefecture. 余呉湖・天女の衣掛柳 [Lake Yogo - a willow hung a celestial robe] (in Japanese). Retrieved 2011-05-13. ^ "General overview of area figures for Natural Parks by prefecture" (PDF). Ministry of the Environment. 1 April 2014. Retrieved 3 July 2015. ^ a b Shiga Prefecture. 滋賀県の紹介（滋賀県なんでも一番） [Introduction of Shiga prefecture; Best scores of Shiga] (in Japanese). Retrieved 2011-05-08. ^ Shiga Prefecture. 滋賀県内の外国人人口 [The number of foreigners in Shiga Prefecture] (in Japanese). Retrieved 2017-11-07. ^ Biwako Visitors Bureau. "Experiencing Ninjutsu (Ninja's techniques) at the ninja's native place – Koka Ninjutsu Yashiki". Retrieved 2011-05-13. ^ The promoting council of production and distribution of Omi beef. 近江牛の歴史 [The history of Omi beef] (in Japanese). Retrieved 2011-05-14. ^ Shiga Prefecture. 滋賀県内の大学・短期大学 [Universities and junior colleges in Shiga prefecture] (in Japanese). Retrieved 2011-05-08. ^ Shiga Prefecture. 湖国観光交流ビジョン　第２章　滋賀県観光の現状と課題 [The vision for tourism and exchange of the Lake Country. Chapter 2: present situation and problem about the Shiga tourism] (in Japanese). Retrieved 2011-05-13. ^ Biwako Visitors Bureau. 滋賀県観光情報：長浜曳山まつり [Shiga tourism information: Nagahama hikiyama festival] (in Japanese). Retrieved 2011-05-20. ^ Shiga Prefecture. 滋賀県の紹介（滋賀県の国際交流 姉妹・友好都市） [Introduction of Shiga prefecture; International exchanges of Shiga, friendship sister cities] (in Japanese). Retrieved 2010-11-25. Shiga-ken hyakka jiten [Encyclopedia Shiga] (滋賀県百科事典, 1984). Tokyo: Yamato Shobo. Wikimedia Commons has media related to Shiga prefecture.